Improving home energy efficiency is a major priority for many homeowners. If you're looking to save money on your heating and cooling costs, the attic is a smart place to start. Many attics lack proper air sealing and insulation, significantly impacting the overall efficiency of the home. Frontier Basement Systems specializes in improving energy efficiency through methods such as air sealing and attic insulation. We can identify problem areas in your attic and provide the right solutions to improve efficiency, save you money, and make your home more comfortable. If you're interested in upgrading your home's energy efficiency with attic insulation and air sealing, call us today at 1-833-428-2988 or click below. 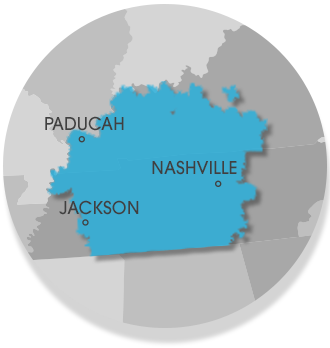 We offer free estimates in Clarksville, Nashville, Jackson and the surrounding areas! About 50% of energy costs are typically attributed to heating and cooling, making it one of the biggest expenses for many homeowers. Air leaks and drafts between the attic and the living space or outdoors, insufficient insulation, poor ventilation, and unisulated ductwork are some of the factors that can dramatically impact your home's energy efficiency and cost you money. 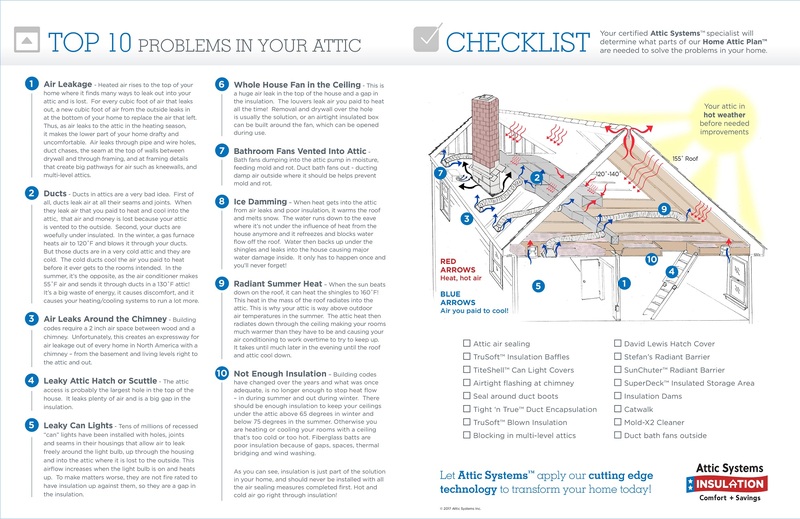 The diagram below outlines some of the most important attic efficiency issues and how we can help fix them (click to enlarge). Air sealing: Air sealing is an essential aspect of energy efficiency. Gaps and cracks that allow the air you pay to heat and cool to escape into the attic cost you money, as does outside air entering the home through the attic. Eliminating air leaks isolates your attic and keeps the air you pay to heat and cool in the living space. Attic insulation: Under-insulated attics will cause problems such as uncomfortable rooms, uneven temperatures, and high heating and cooling bills. When your attic insulation is raised to the recommended levels, it will will prevent heat transfer between the attic and the rooms below, allowing your heating and cooling systems to run less frequently and for shorter times. Ductwork services: Ductwork in the attic has a huge impact on energy efficiency. 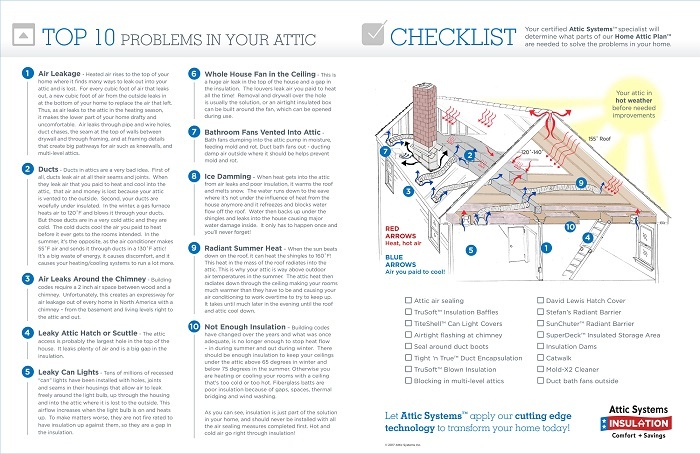 Attics have more extreme temperatures than the living space, heating or cooling your ductwork accordingly. This means that in the winter, warm air is sent through cold ducts, cooling the air down and forcing your furnace to run longer to get your home to the right temperature (the reverse is true in the summer). This is obviously very inefficient, which is why duct sealing and insulation are essential to improving efficiency and reducing heating and cooling costs. Tired of dealing with high heating and cooling costs and uncomfortable rooms in your home? Frontier Basement Systems specializes in improving energy efficiency through attic insulation and air sealing, and we can help improve your home too! Give us a call today at 1-833-428-2988 or contact us online to get started on improving your attic efficiency. We offer free estimates on all our work in Clarksville, Nashville, Jackson, Owensboro, Murfreesboro, Bowling Green, Philpot, Utica, Fayetteville, Marion and throughout the surrounding areas.